Effective the 2013-2014 season, the age of introducing Body Checking will move from Peewee to Bantam at the Representative Level placing continued emphasis on body contact for the Peewee age group. This change is the result of recognizing changes in the game of hockey. The priorities of the Ontario Minor Hockey Association remain dedicated to player safety, providing young athletes with the opportunity to best develop and acquire skills (see LTPD), and keeping as many players playing the game as possible. Education will remain a priority focusing on the 4-Step Checking Progression, which begins the first time a young player steps on the ice. This progression emphasizes the practice of positioning, angling and stick checks followed by Contact Confidence and Body Contact which is taught at the later stages of athlete development. The most essential skill in hockey, which is the prerequisite to most others, is skating. The ability to skate efficiently and effectively allows a player to begin to effectively develop all other skills involved with the game of hockey. Players will be unable to grasp and execute skills such as positioning and angling if they are unable to skate comfortably and control the edges of their skates with ease. It is vital for a coach to ensure that the foundation of all other skills, skating, is mastered before moving on to more advanced skills. A common misconception is that the skill of checking begins at a certain age or age category of play. 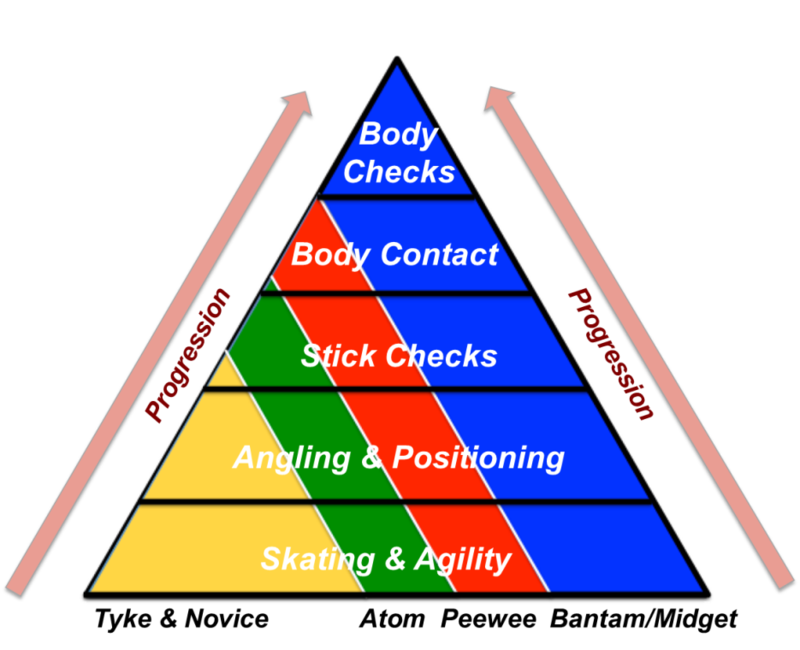 In fact, checking is a 4-Step Progression that begins the first time a young player steps on the ice. Each step builds upon the previous step and brings the hockey player that much closer to being able to give and receive body checks competently and confidently. Angling can be considered the first line of defense for a player. Body and stick positions are important in checking without making contact. Angling is the ability to force your opponent to go in the direction that you want. This normally would be towards the boards or to the outside of the player. Defensive play begins the instant the opposing team possession of the puck. Checking is used to regain possession of the puck. To review the steps in the progression – skating, positioning and angling are used to direct the puck carrier. This is accomplished by using the stick as an active line of defense in attempting to further control the opponent. Body Contact is the third step in the progression and is used to gain separation, when a player positions his/her body between the puck and the puck carrier. Body Checking is the final step in the 4-step checking progression. A body check can be defined as body contact primarily caused by the movement of the checker. That movement can be and often is, in a direction different than that of the puck carrier. The checker uses their body for the purpose of stopping the attacking progress of the puck carrier and/or to separate the carrier from the puck. The skills needed for body checking are the effective mastery of the first three steps in the checking progression. First of all the checker must be a strong skater with particularly good balance on their skates.